A gunman killed at least three people and wounded a dozen others at the famed Christmas market in the French city of Strasbourg before fleeing the scene, authorities said. Three people were killed in the attack and 13 wounded, eight of them seriously. The Strasbourg gunman yelled “Allahu Akbar” (“God is greatest” in Arabic) as he opened fire on people enjoying an evening out at a Christmas market, the Paris public prosecutor told reporters. Interior Minister Christophe Castaner said France had raised its security alert level to “emergency attack” with “the implementation of reinforced border controls and tightened controls on all Christmas markets in France to avoid the risk of a copycat” attack. The gunman, Strasbourg-born Cherif Chekatt, 29 was on a “S” security and terror watch list. Anti-terrorist prosecutors have opened an investigation. “Terrorism has once again struck our soil,” said Strasbourg prosecutor Rémy Heitz at a press conference on the following day. Mr. Chekatt has 27 previous convictions in Germany, Switzerland and France, and was placed on the terror watch-list while in prison in 2015 after he showed signs of radicalization. Four of the attacker’s relatives were also detained by police on Wednesday. Questions were being raised over how the assailant had managed to evade capture. Police were due to arrest him for attempted murder after a botched armed robbery, but he had escaped, and a long rifle and stun grenade were found at his home. Police reported the attacker was shot and wounded by patrolling soldiers before he fled the scene. According to France Info, the suspect took a taxi driver hostage to escape soldiers. The driver reportedly escaped unharmed and said the gunman had a wounded arm. Mr. Chekatt justified his acts to the driver and said he had “shot at soldiers and killed ten people”, according to Mr. Heitz. While the hunt for the attacker goes on, France says it cannot “rule out” that a suspected terrorist has fled to neighboring Germany. Christmas markets have been considered a terror target ever since the foiled terror attack in December 2000. The Al-Qaeda plot, in which a truck bomb was due to be detonated beneath the steps of Strasbourg cathedral, next to the market, has been described as blueprint for would-be attackers. The plot failed when British intelligence tipped off the French and German authorities after intercepting a call to the suspected paymaster in London. France remained on high alert after a wave of attacks commissioned or inspired by Islamic State militants since early 2015, in which about 240 people have been killed. Fears of terror strikes had waned in recent months. Instead, the country has been more concerned about an ongoing nationwide “yellow vest” revolt as protesters call for lower taxes and higher wages. In order for anti-terrorism agencies to figure out what goes wrong and how to fix it as soon as possible, they must remain one-step ahead of attackers who chose to exploit the very democratic system that gives them freedom from oppression of dictatorial regimes. How can counter-terrorism agencies combat individuals who are cunning and determined? They’ve been in combat and are careful not to stand out or give law enforcement an excuse to arrest them. In follow-up on the 2015 Paris attacks, “We lack the most obvious tools to deal with this threat,” said Jean-Charles Brisard, chairman of the Paris-based Center for the Analysis of Terrorism. “We’re blind.” It is urgent that the European authorities combat terrorism head-on with the most advanced technologies available at their disposal to eradicate this problem of home-grown, self-radicalized terrorism before it takes more lives. It is true that authorities have been unable to distinguish between terrorists and innocents until it is too late, and the terrorists have carried out their terrorist attacks. Since the terrorist attacks of 9/11, the same scenario has been repeated over and over again in Western countries: Authorities are aware of a terrorist suspect, but they lack sufficient evidence of his terrorist affiliations, capabilities, and/or plans to act, until it is too late. Brainwave Science is a company established in post 9/11 era with a mission to offer its ground-breaking iCognative Technology with applications in National Security, Counter-terrorism, Border Security, Human and Drug Trafficking, Criminal Justice, and Immigration Control for law enforcement agencies worldwide. The motto of Brainwave Science is to relentlessly deliver truth and justice for governments, national security agencies, law enforcement agencies, corporations, and individuals at a global level through its proprietary iCognative technology is based on patent-free iCognative scientific technique and available at global level for the first time in history. Counter-terrorism agencies seem to have adopted reactive approach to terrorism problem so far, there is a much-needed change in approach to terrorism that is warranted from governments and law enforcement around the world. iCognative empowers these agencies to take a proactive and preemptive approach in their war against terrorism. It is this characteristic to prevent terrorism that makes this technology (only developed and provided by Brainwave Science) – a must have tool in their arsenal for any country serious about their fight against terrorism. ISIS, Al Qaeda, Hezbollah, AQAP, AQIM are formally identified as terrorist organizations and threats to the U.S. and the West. iCognative by Brainwave Science provides a scientific solution to the fundamental problem in counterterrorism: distinguishing between terrorists from innocents, before the terrorists’ strike. 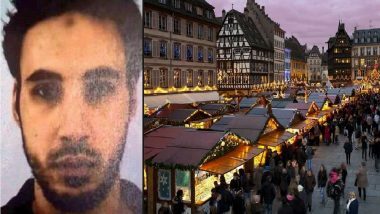 In the most recent attacks in French city of Strasbourg, the authorities have confirmed that the suspect Cherif Chekatt was on a “S” security and terror watch list. Before the cops could apprehend him, he escaped. Terrorists have become smart they are adept with new technologies have also contributed to complication of problems faced by law enforcement agencies. While the law enforcement agencies in a country like France are bound by legal processes and are expected to refrain from infringement of rights and freedom of expression, the terrorists quadruple investigation challenges by use of encryption and the inability of law enforcement to get into locked cell phones. iCognative technology taps in to the source (the brain) of all information related to terrorism-related skills, such as firearms and bomb making, they possess. Terrorists can no longer hide when their brains are ready to reveal all. iCognative technology is a perfect solution where traditional and existing systems fail for lack of sufficient evidence. Once a iCognative test is conducted on Cherif Chekatt, authorities can collect all evidence necessary for successful conviction, additionally they can gain valuable intelligence from iCognative test conducted on five family members arrested in relation to this case. It is possible to discover the money trail, the hierarchies in an underground terrorist network and with such key intelligence the counter-terrorism authorities in France and in other European nations may very well be able to dismantle the whole network that supports such individuals. iCognative can easily detect terrorist knowledge and threats—even being able to detect if a suspect has been in a sleeper cell. This can be accomplished by searching for knowledge of bomb and IED making and terrorist training. In counter-terrorism, there is no comparable technology available that can help catch terrorists throughout the world. iCognative by Brainwave Science can identify active or inactive terrorists before and after any terrorist act happens.